d-Wise recognizes that every Life Sciences organization has a slightly different implementation of CDISC Standards. As such, we offer the ability to efficiently customize our workshop suite to meet the unique needs and challenges of your organization. 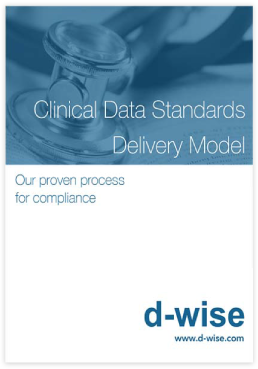 d-Wise is a CDISC Platinum Member, a core contributor on key CDISC committees, and a recognized leader in establishing, implementing and efficiently leveraging CDISC Data Standards within a wide variety of clinical environments. 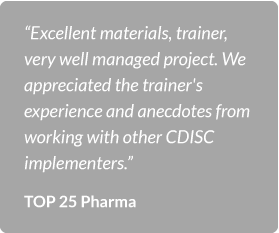 We're pleased to offer a CDISC workshop suite that equips your staff with the fundamental knowledge to effectively implement CDISC Standards. Our experts provide practical solutions to help our clients get the maximum value from their investment in newly implemented standards programs. Our 2-day intensive course provides a foundational workshop on the theory and practice of using the CDISC Standards, designed to give implementers a better understanding of how to apply the theory and practice within their own organizations. It trains users to design, implement and manage clinical data standards processes and governance. During the course, participants will engage in various hands-on classroom activities and individual exercises that reinforce course topics. * Additional modules providing in-depth knowledge of CDASH or ADaM may be added to the foundational offering. How do your submissions measure up? The FDA and PMDA require Life Science organizations provide data according to CDISC Standards for certain types of regulatory submissions. At the 2017 PhUSE Computational Science Symposium, the FDA reported that nearly half of all CDISC submissions received between January and March of 2017 failed the FDA's Technical Rejection Criteria. The FDA has since appealed to Life Science organizations to improve the quality of their CDISC submissions - the agency has been clear - all future submissions must conform with CDISC Standards. FDA Binding Guidance Goes into Effect 11/2016 Sponsors whose studies start after December 17, 2016 must submit data in FDA-supported formats listed in the FDA Data Standards Catalog. This module provides a high-level overview of data standards, CDISC, as a standards development organization, and core CDISC products that support clinical research and development. This module examines regulatory requirements for the submission of standardized study data. This module also explores the CDISC Foundational Standards - Controlled Terminology, CDASH, SDTM, and ADaM. Finally, this module discusses key processes and artifacts for submitting CDISC datasets to regulatory authorities. This module examines the notion of "terminology" and explores key CDISC Controlled Terminology concepts. This module also includes a hand-on exercise representing collected values in SDTM controlled terminology. This module provides an overview of SDTM including key SDTM concepts such as observations, variables, domains, and domain classes. This module also explores SDTM compliance and key SDTM assumptions. Finally, this module introduces the SDTM domain classes and domains featured in subsequent modules. This module provides an overview of SDTM Trial Design Datasets and Special Purpose class domains. This module examines key concepts for Trial Design Datasets and Special Purpose class domains. Finally, this module explores key Trial Design Datasets and Special Purpose class domains. This module provides an overview of SDTM Interventions and Events class domains. This module examines key concepts that apply to both Interventions and Events class domains as well as key differentiators between an intervention and an event. Finally, this module explores key Interventions and Events class. This module provides an overview of SDTM Findings class domains. This module examines key concepts for the Findings class and explores key Findings class domains. This module also includes a hand-on exercise representing collected data in SDTM Findings class domain. This module describes approaches for representing relationships between observations within a given domain and across two or more SDTM domains. This module explores the Findings About domain, RELREC, and supplemental qualifiers. Finally, this module contrasts the use of Findings About and supplemental qualifiers. This module provides a high-level review of the workshop course and includes a hands-on exercise representing collected data in SDTM.